Jeffco School Board President Ken Witt: Silent but Deadly? The Jefferson County school board's new majority may have skirted a law that requires them to conduct business openly by hiring an attorney without a public interview process, according to an open-government expert. Thomas Kelley, a lawyer for the Colorado Press Association and The Denver Post, said the board's 3-2 decision last week to hire Colorado Springs-based law firm Miller Sparks LLC may have violated the state's open-meetings act, which requires board members to conduct business in public. "It's not all that common for a board of a public entity to, by itself, conduct interviews, but when they do, at least when it doesn't involve interviews for a personnel position, they have to do those interviews in public," Kelley said. 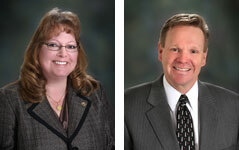 Got a question for Jeffco School Board members Julie Williams or John Newkirk? Keep it to yourself! It's certainly not an auspicious start. Let's stipulate the new majority, elected with the help of voucher advocate Alex Cranberg and others, came in facing suspicions from certain quarters about their intentions. Would they push for vouchers? Would they focus less on neighborhood schools and more on charters? Was Jeffco about to go the way of Dougco? I reached out to Witt, the board president, to see if he could ease some minds about the majority's agenda, but did not hear back from him. That leaves us to judge the events at face value. Kerrigan then revealed that a contract had already been drawn up by a Colorado Springs-based law firm that currently represents Jefferson County schools. Because next week's board meeting will be its last before a three-week hiatus, the seven members are now expected to vote on the matter just six days after learning of it. While the Denver Post noted the fact that Kerrigan apparently knew about the Jefferson County contract with attorney Brad Miller before it was even brought up at the Jeffco Board meeting, we have yet to see any explanation for this from Kerrigan or the Jeffco Board. Also curious: the Thompson School District contract for Miller's law firm was dated just two days after Kerrigan was elected Board President. Something doesn't smell right here, and the stink is only going to get worse as board members continue to stay silent. At least they dated the contract after the swearing-in and board president election. They could have just started the ball rolling as soon as they were sure they'd won the election without waiting for a swearing-in. There is far more to this story than has been revealed. First, the Miller Sparks firm has been hired by the Mesa school district, the JeffCo school district and the Thompson Valley school district (Loveland) and the firm already represents 20+ charter schools. This is a two person firm. How are they going to handle all the work? In none of the three school districts were RFP's issued so other law firms could compete and present their credentials. It was a sole source contract. In Loveland, the new school board president said Miller Sparks was hired for two reasons. First, the school board needs its own attorney separate and apart from the counsel to the school district. He couldn't site to any conflicts between the board and the district or any other reason it is necessary to waste the district's money hiring additional lawyers. Second, the new board president in Loveland said Miller Sparks is being hired to review the material the district administration supplies to the board members before each meeting. Sometimes the material may be 200+ pages and the lawyers will cull through it and reduce the amount of paper the board receives. I've served on education boards and almost none of the material supplied to a board has anything to do with legal issues, so why in the world is a law firm being hired to filter the information the school board members receive? There is only one explanation. The new board members don't want any information made public that might contradict their agenda. By the way, like JeffCo, the new board in Loveland won't reveal their agenda. Second, there is a common thread involving a lobbyist in this story that hasn't been revealed yet. Amy Attwood, a losing 2012 Republican candidate for state representative in a Lakewood, Colorado district, has been hired by the Mesa school board, the JeffCo school board, and now the Thompson Valley school board to lobby at the state capitol. She was hired without an RFP. She was hired on a sole source contract. And here's the funny thing about it. She doesn't have any experience lobbying for education or anyone else. She first registered with the Secretary of State as a lobbyist a few months ago. The Mesa, JeffCo and Thompson Valley school boards have some explaining to do. 1. What is the basis for sole sourcing a contract for legal services to the same law firm – Miller Sparks? 2. Why was it so important to hire Miller Sparks? 3. What communications between board members in all three districts took place outside a public forum about Miller Sparks? Did those discussions violate the Open Meetings Act? 4. At least in the Thompson Valley case, why do you need to hire a lawyer to cull through and filter the information the school board receives from the school district? Why should a law firm be hired to do this when almost 1005 of the material has nothing to do with legal matters? Why do you think a law firm is competent to filter the material? And what expertise does Miller Sparks have to perform such a task? 5. Why did the boards in all three districts hire Ms. Attwood to lobby when she has no experience as a lobbyist in any field, including education? 6. Why did all three boards hire the same lobbyist on a sole source contract? 7. Were their discussions between the board members outside a public meeting where they discussed and decided to hire Ms. Attwood? Did those discussions violate the Open Meetings Act. 8. What is the specific "reform afgenda" the three boards intend to implement? The bottom line is obvious. This is a coordinated statewide effort to implement a right-wing conservative agenda in some of the biggest school districts in the state. These new board members ran as "reform candidates" yet they refuse to state what specific reforms they intend to implement, all hire the same attorneys and the same lobbyist and apparently don't think anyone should be asking questions. It is time the Colorado newspapers and TV investigative reporters shine the klege lights on these people and make them answer questions. Wow, this is a lot to digest. I'm getting on the phone about this now though. Is there anything in Colorado ethics rules that might apply here? Does sole source, no bid contracting outside the public eye constitute a violation of any law other than the Open Meetings Act? Had either the lawyers or the lobbyist been paid by any of these three boards prior to the public board meetings at which they were "officially selected"? Whick "Mesa" school district are you referring to? Mesa County Valley School District 51 or some other district? According to the Secretary of State's website, Amy Attwood has been receiving lobying payments from Mesa County Valley School District 51 since July. She is operating as the principal of Attwood Public Affairs. It looks like she is on a monthly retainer. Interesting. Attwood did not show up on the BOE agenda (consent or otherwise) for Dec. 12. I wonder when that contract was signed. It certainly has not been made public and no mention of hiring a lobbyist different from the one the district had been using was mentioned either. And why hide it? They have the votes to push these things through, so it's very odd that they're shunning the public process and possibly breaking all those laws about public business being done in public. My information comes from the Loveland area. Your information is incorrect. Attwood does not represent Jeffco. What about Mesa and Thompson Valley? I've just spoken to an extremely reliable–Democratic, definitely didn't vote for the conservative slate–source on this, and the statements about Amy Attwood are categorically false. She doesn't have the Jeffco school board lobbying job, has not applied for one, and does not want one. The lobbyist in this position is the same guy (I've forgotten his name) who lobbied for the old board. She would be willing to comment for publication on the matter, if anyone is interested in writing a fair diary. I'm not accusing you of making things up, Republican36, but your information is bad, and if I were you I would have serious questions for whoever sold you on that story. If I'm wrong of course the truth will out in public documents, but I very, very seriously doubt it, since Amy is willing to go on-record with this. There's a lot at stake with this school board stuff, and my best guess is tht someone with something to gain by smearing Amy's name has hijacked a hot story without a shred of evidence, and gotten others to run with their false allegation. PC (and to others who have commented about my post) I'm running the traps this morning with my sources. I will post a comment later either retracting my comment about Ms. Attwood lobbying for JeffCo with an apology or with confirmaiton. So far it looks like it will be the former. More later this morning. You've always been a thoughtful, measured, and honest poster, R36, and your approach to receiving criticism on this post demonstrates the same. I'll check back later in the day to see which conclusion you've come to. PC and to the others who called me on the JeffCo lobbyist issue I must offer my apologies and acknowledge my error. Yesterday, I posted that Amy Attwood had been hired by the JeffCo board to lobby for them before the General Assembly. You were right and I was wrong. I went back to my sources and they turned out to be wrong about this, but be that as it may, I'm the one who wrote the post, and therefore it is my responsibility. I apologize to everyone here on Coloradopols and to Ms. Atwood. Thanks for correcting this. Much respect for you. R36 has always been a class act. And Mesa and Thompson Valley? Your error is now corrected- the overall story still raises concerns. What evidence do you have that Amy Attwood has been hired by JeffCo? I am getting communications from my very connected Dem side of contacts saying your comments about Attwood being hired by JeffCo are utter BS Rep36. I find these actions to be very concerning. They signed a contract to cover themselves without even telling the other 2 school board members. This makes it look like they are going to steam roll anyone that gets in thier way and pay for it with our tax dollars. This means fewer dollars to the classrooms and teachers. Unless we do something so much for Jeffco having traditions of excellence. If that's the only thing that's incorrect htere's still plenty here that stinks. Has anyone heard about an upcoming weekend meeting of the board? I was told to watch for a surprise announcement. I missed the meeting as I was airborne, but it was a very strong showing. Going to take a lot of arrogance to go ahead and vote to hire Miller Sparks and Attwood in spite of these citizen concerns. The board needed a new attorney, because the former attorney Allan Target quit (yet the Superintendent Stevenson forgot to notify the board of this), there were also communications with all board members via e-mail that had specifics. The former attorney, Allen Taggart was hired by Superintendent Stephenson in 2010 at a fee of $150,000.00 per year. The basic agreement that has been published in print media shows the new attorney could generate a cost savings of $60,000.00. Not counting what money was paid when Allen Targets previous law firm Caplan and Earnest worked additional district issues. Mike–Allan Taggert was the attorney for the whole district, not just the board attorney. Hiring for the district attorney position is done by the superintendent. The contract for Miller Sparks LLC specifies only 30 hours in a month, all related to BOE work including agendas and such. The district needs a lawyer for a number of other issues. While the board can decide to hire a laywer specifically for the board, they cannot hire one for the district (and needless to say, certainly cannot do so without a competitive bidding process and being forthright about the amount of money involved). Miller is not a replacement for Taggert. The district still needs a new full-time attorney, so the costs for Miller are on top of whatever salary the new attorney receives. And Taggert's retirement was not a mystery or surprise. His last day is Dec. 31. It's not like he just up and resigned.